Yesterday I ran 6 miles and it was easy to slow down because the humidity did it for me. I didn’t even look at my watch cause I knew I was shuffling & struggling to breathe. I always tell people not to even pay attention to pace when it’s this hot and humid out. When you’re not breathing normally, oxygen can’t get to your muscles, so don’t expect for them to run fast. You know those days where it’s so hot you can just see the steam off the ground? That was yesterday. The picture below was taken so you can see how sweaty & gross I was even though I was running 2+ minutes over my race pace. Sunday’s race weather is set for partly cloudy 55 low/75 high, couldn’t have asked for better race weather! 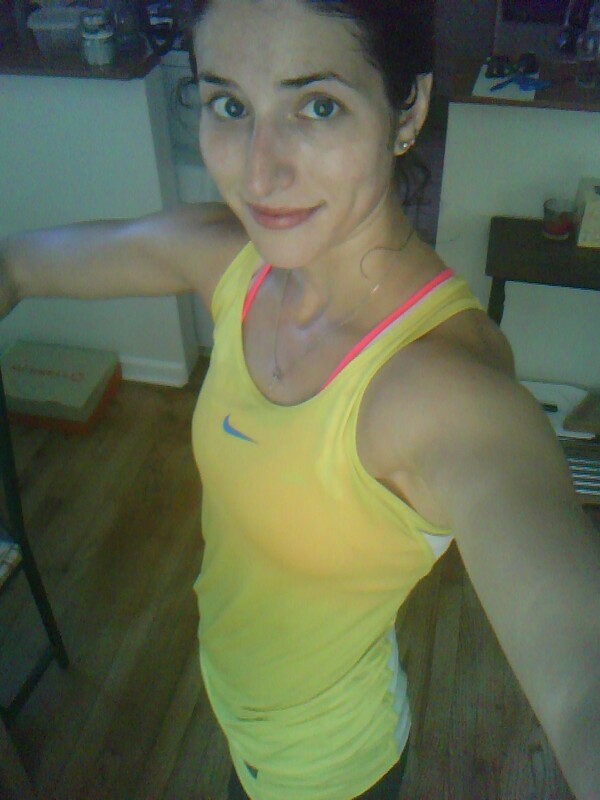 my pink sports bra + yellow tank= bright orange! The last days leading up to a race I watch videos of races & runners to get me pumped up. Lately I’ve been watching the 2012 Olympic Marathon Trials. 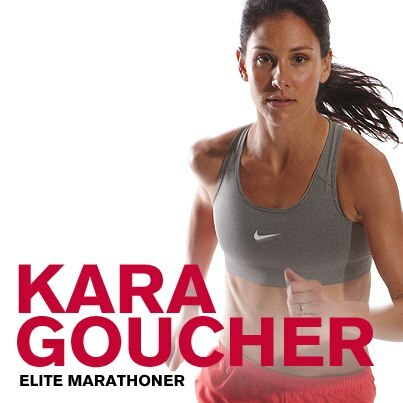 Every time I see Kara Goucher finish she inspires me beyond the meaning of the word inspire. At my very first 1/2 marathon in 2009 she raced and finished in a blazing 1:08:05. If that’s not impressive enough, she actually won the entire race– over every woman AND man. I didn’t know who she was when I saw her during my first expo experience and I knew nothing about the elite running world while I was training, but she definitely changed the way I thought about running and my passion for the sport. A few months ago I let her know I adore/love/watch/stalk her…and she LIKED MY POST. I freaking love this girl. Besides stalking elite runners, another thing I do is get my 1/2 Marathon Playlist in order for race day. I am a firm believer that you can’t just wing it when it comes to music. You can’t play Pandora and hope the commercials won’t get on your nerves at mile 8. You can’t shuffle your ipod and mess with skipping songs for hours on end. For the love of God, pull yourself together and put ten minutes of time into orchestrating THE SOUNDTRACK for your race. There have been plenty of studies showing how music can help you push through fatigue and pain during workouts, so use this to your advantage! -What is your estimated finishing time? Make sure the time of the playlist is long enough so you don’t hit the end of the playlist and have to mess with finding more music. You need your playlist to last as long as it will take you to cross this finish line–and then some. Just in case you don’t hit your goal time, having an extra 10-15 minutes of inspiring & fast paced music will help you finish strong, instead of giving up just because your MP3s do. -How are you pacing the race? Are you trying to start out slower to save energy? If so, don’t play Skrillex or crazy dance music right out of the gate. -When do you normally get tired in training runs or races? For me it’s about mile 8 where I start to feel it. This is where I will estimate the mile 8 time in my playlist and place music that inspires me. Power songs. Put them where you think you will need a pick-me-up! Your playlist will be ready to give you inspiration, energy and encouragement without you having to search for the songs and waste time. -And always, make sure you charge your iPod/MP3 player the whole night before your race so it doesn’t die on you halfway. The biggest letdown/heartbreak is the sound of silence halfway into a race. Now I’m off to pack for the weekend. I almost forgot I already put my Checklist on here! What are your running plans for the weekend? Long run? 5k? Race? I’m coming for you Philly!! What is your favorite pump up song for racing?? mine is Like a G6 by Far East Movement. Categories: Uncategorized | Tags: Kara Goucher, Playlist, pre-race | Permalink. Hands down, Dirrty by Xtina is my go-to song when I need a boost. It reminds me that “there’s no stoppin, gotta keep it poppin.” Obv. Britney is my go-to for my last 5k boost. hahah. 90s pop for life!